An aircraft can be stable at higher speeds but unstable at low speeds. While a more rearward center of gravity (CG) may cause instability, it not only reduces the lift force and induced drag produced by the tail, but makes airspeed more sensitive to elevator trim setting. Adding ballast may make an aircraft more unstable, but a ballasted aircraft is normally flown faster. First a review of an airfoil's moment coefficient (Cm). Then, an analysis of an aircraft's pitching moments over a range of CG positions. Figure-1 shows a typical airfoil measurement from the UIUC database. 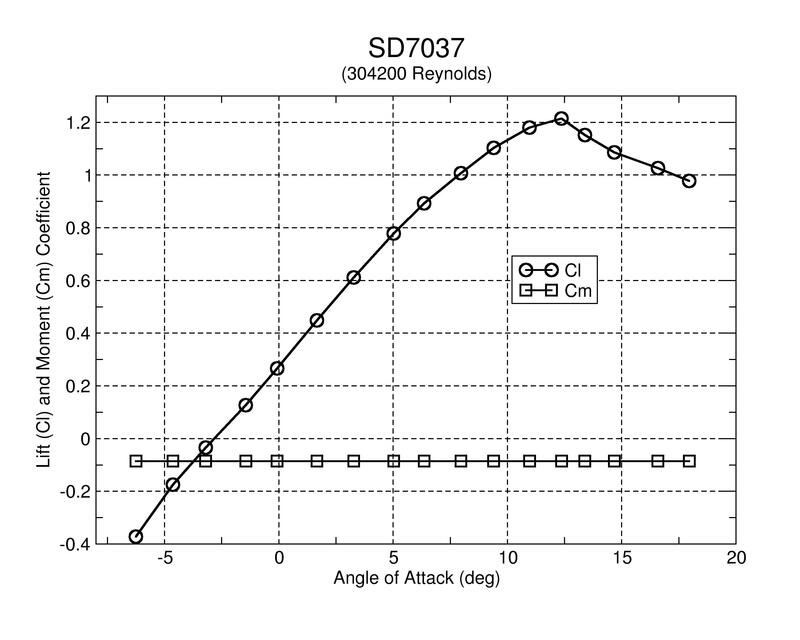 It shows curves for the lift (Cl) and moment (Cm) coefficients for various angles of attack (AOA). The lift coefficient (Cl) varies significantly, steadily increasing until stall occurs. It is common for an airfoil moment coefficient (Cm) to be constant and negative. 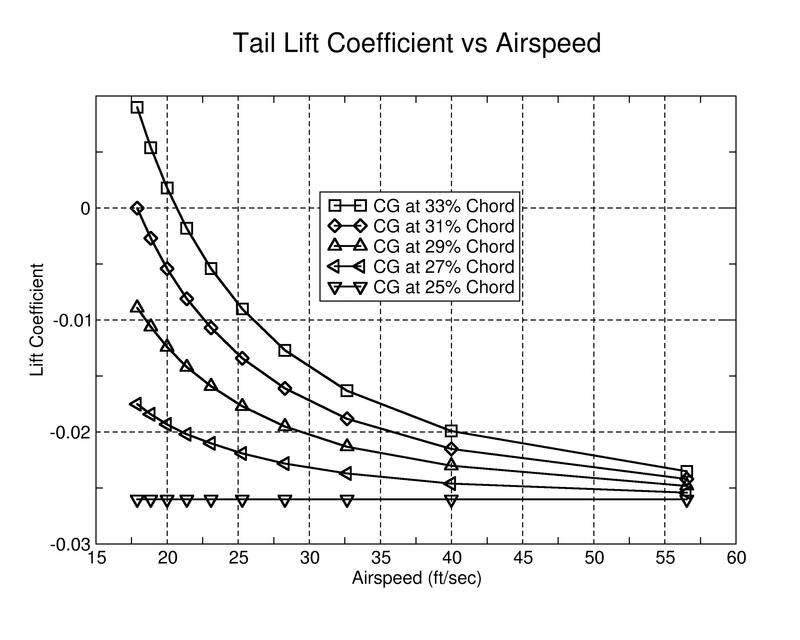 The resultant of the lift force (L) is generated through the aerodynamic center (AC) of the airfoil, typically 25% of the chord. The moment (M) is a rotational force measured in foot-pounds or newton-meters. A wrench applies a moment on a bolt; a motor generates a moment around a shaft. A negative coefficient indicates a nose-down direction, forcing the leading edge of the wing down and the trailing edge up. 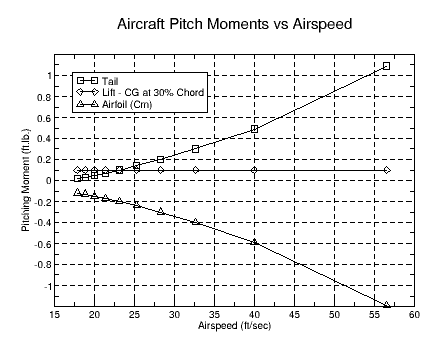 The relationship between pitching moment and the total lift of an airfoil can be confusing. As figure-1 indicates, the Cl and Cm coefficients are independent. Consider a typical wing in a wind tunnel at a constant airspeed. As the angle of attack is increased, the lift will increase as predicted by the equations. However, the moment will remain constant, even when the lift is zero. Also consider that the moment does not change direction when the lift coefficient becomes negative. Four forces affect the overall pitch of the aircraft: the airfoil pitching moment (Cm), the lift produced by the wing, the lift force produced by the horizontal stabilizer, and drag. Lift only affects pitch when the CG is not located at the AC of the wing. Likewise, drag produces a moment when its center is either above or below the CG. The moment produced by drag will be ignored in this article. The horizontal stabilizer and wing lift forces produce moments determined by multiplying each with their respective moment arms. Their moment arms are the distance between the aircraft CG and AC of the tail and wing respectively. The sum of all three moments must balance (equal zero) for the aircraft to maintain it's pitch. Otherwise, it will constantly rotate upward or downward. Balanced pitch does not mean that the pitch angle will remain unchanged. For stability, there must be some mechanism to maintain the pitch orientation of the aircraft. This orientation may be affected by tubulence or a change in airspeed. A conventional approach to maintain stability is to have the horizontal stabilizer generate negative lift (a downward force). As the airspeed increases, the tail lift increases pushing the tail down and slowing the aircraft. 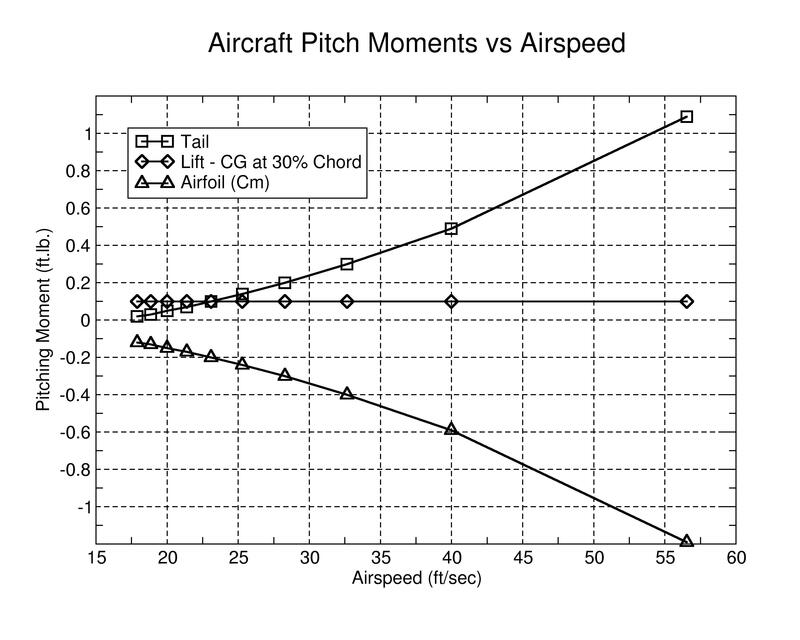 Figure-2 plots the three moment forces vs airspeed for a CG located at 30% of the chord length (10"). The lift and its moment are constant since it must balance the weight (38 oz) of the aircraft. The lift moment produces a nose up force, and is therefore positive. The airfoil moment (M) is dependent on airspeed, wing area (900 sq.in.) and chord length. Cm is negative as well as its moment (M). It produces a nose down force. As the airspeed increases it produces a greater negative moment. The tail moment must balance (equal but opposite) the sum of the lift and airfoil moments. In this example, the horizontal stabilizer always produces a nose up force. Even though the horizontal stabilizer produces a negative (downward) lift force, the moment is positive (nose up). The aircraft becomes unstable in pitch if the tail is required to produce positive (upward) lift in order to balance the sum of the airfoil and lift moments. This would be indicated by a negative (nose down) tail moment, and is most likely to occur at low airspeeds. 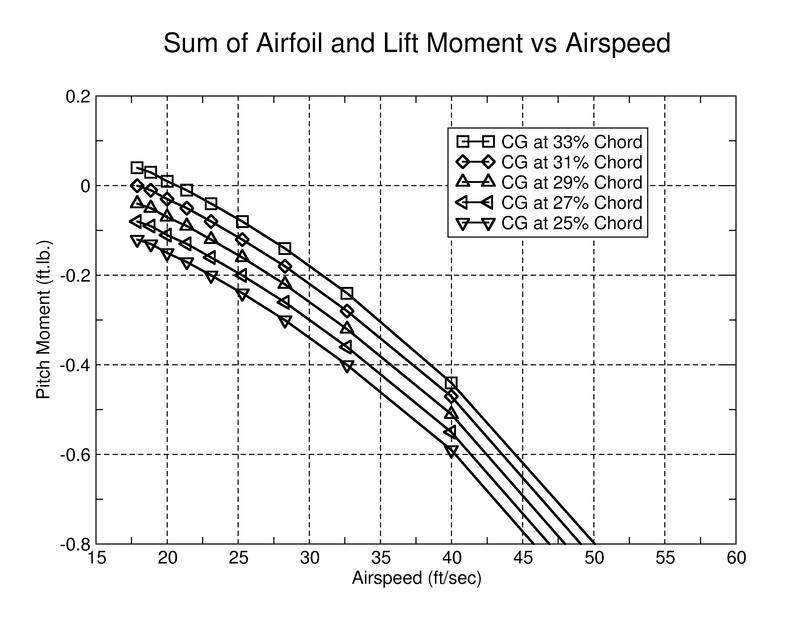 Figure-3 plots the sum of the airfoil and lift moments versus airspeed, for CG ranging from 25 to 33% of the chord. For all cases, the airfoil moment contribution is the same as in figure-2. As the CG is moved more rearward the lift moment arm and its moment increase. The lowermost curve is for the case where the CG is at the AC of the wing and the lift moment arm is zero. Therefore, the lift moment is zero, and this curve is purely the airfoil moment. The uppermost curve is for the case where the CG is at its most rearward position. 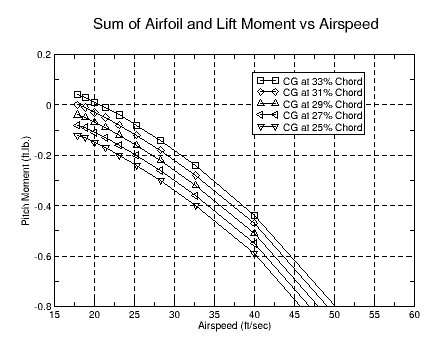 At each CG position, the lift moment is constant with airspeed, and simply shifts the airfoil moment curve upward the same amount at all airspeeds. As the CG is moved rearward, it is more likely to cause an unstable situation at low speeds. As the 33% case shows, a negative tail moment is required below an airspeed of 20 feet per sec. A negative tail moment requires a positive (upward) tail lift, which no longer provides a pitch correcting mechanism. Figure-4 shows the corresponding tail lift coefficients for the cases shown in figure-3. 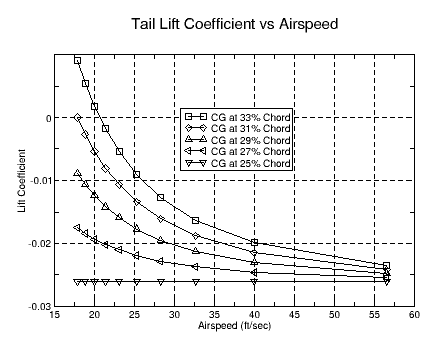 The lift coefficient is calculated from the required tail moment. The plot for the 33% case clearly shows that the lift coefficient becomes positive at low airspeeds, producing an unstable, non-correcting situation. When the CG is at the AC and the lift moment is zero, the horizontal stabilizer and wing pitching moment must balance one another (the lowermost curve). Both are equally affected by airspeed. There is only one trim setting where they both balance one another, and will do so at all airspeeds. For all other curves in figure-4, when the lift moment is not zero, the aircraft will be balanced at only one airspeed depending on the tail lift coefficient. The lift coefficient depends on the elevator trim setting. The figure also shows that as the CG is moved rearward there is a greater change in lift coefficient per a change in airspeed. This means that for a more rearward CG, there will be a greater corrective force for a smaller change in airspeed. In other words, stable airspeed will be more sensitive to elevator trim setting. The pitching moments of an aircraft can be balanced with a horizontal stabilizer that provides positive lift, but negative (downward) lift, producing a positive moment, is required to provide pitch stability. Because the lift moment is constant but the airfoil and horizontal stabilizer moments are airspeed dependent, a negative tail moment may be required at low airspeeds. This is more likely to happen as the CG is moved more rearward. The aircraft can therefore be unstable at low airspeeds, but stable at higher speeds. A more rearward CG results in a corrective force more airspeed dependent, making the stable airspeed more sensitive to elevator trim setting. Adding ballast is more likely to cause low-speed instability, but a ballasted aircraft is flown faster. In flight camber adjustments will also affect balance and stability. This article came about after studying tail lift forces and CG position. 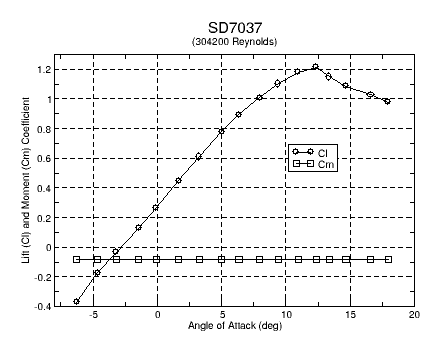 The analysis helps me understand why a seemingly stable aircraft can behave poorly at low airspeeds. Unlike other technical articles dealing with aircraft design, CG position is something every pilot must consider. I hope others will contribute articles on this and other technical subject. My sincere thanks to Dave Register for his review and discussion of this article.